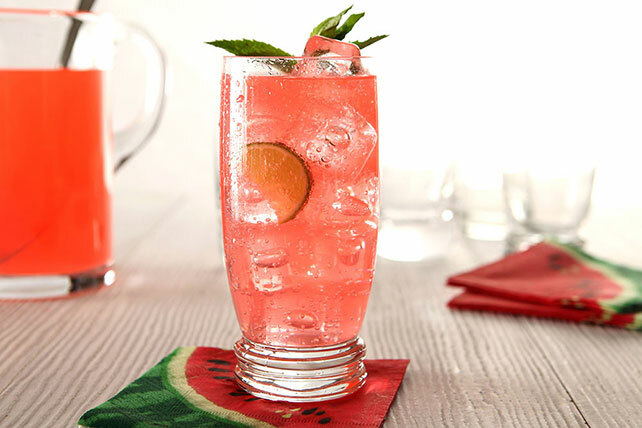 Live it up with our Sparkling Watermelon-Mojito Punch. This Sparkling Watermelon-Mojito Punch gets its great flavor from fresh lime juice and mint. Add seltzer to combined sugar and drink mix in 2-1/2-qt. glass or plastic pitcher; stir until mix is dissolved. Pour into ice-filled glasses. Squeeze lime wedge into prepared drink in each glass. Garnish with mint. Freeze extra mint leaves in ice cube trays with water. Serve with prepared punch.